Verse 8: The Last Seal? For the mobile version, see Drakengard (Mobile). 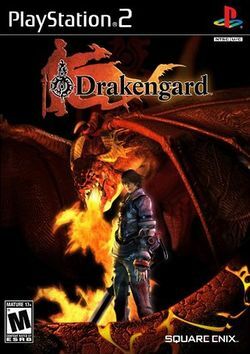 Drakengard is a mixed genre 3D Beat 'em up and aerial Shooter game with RPG elements for the PlayStation 2. Developed by Cavia and published by Square Enix and Take Two Interactive, the game was released on September 11, 2003 in Japan. Drakengards music was scored by Takayuki Aihara and Nobuyoshi Sano. The game's sequel, Drakengard 2, was released in Japan on June 16, 2005. It takes place 18 years after the events of the original Drakengard. Drakengard takes place in a fantasy medieval time that combines technology, magic, and mythical beasts. Players get to control various humans, wielding powerful weapons and the ability to call for help from their respective "pact beast." "It is an ancient time, and dragons still roam upon the earth. Two great powers, the Union and the Empire, wage fierce war for the control of a goddess who protects the harmony of the world. Hidden in three sacred places scattered throughout the world are the great seals. A fourth seal, which unites and protects the others, is embodied in the life of a single woman. This woman is called the goddess. The legends say that should these seals be broken, the gods themselves will sow upon the earth the Seeds of Resurrection. Some claim that these seeds will bring forth the salvation of all mankind." This page was last edited on 4 November 2008, at 19:04.